When we first started publishing Azerbaijan International in January 1993, we soon ran into problems printing the new Azeri Latin alphabet that had just been adopted in December 1991. The major culprit was that peculiar character that we dubbed "the upside-down 'e'" (the schwa) which does not exist on standard Latin-based computer keyboards. In fact, no language uses such a letter. Consequently, back in those early days, we soon discovered that if we wanted to publish anything in Azeri, we had to design our own fonts. Theoretically, the problem has now been solved via fonts created for UNICODE which enables IBM and Mac computers finally to "talk" to each other using the upside-down "e". Yet, in essence, the problems related to file sharing, viewing Web sites, writing e-mails and doing spell checks won't be resolved until every computer user has an advanced enough system to accommodate the necessary fonts. Eleven years have passed and the nightmare has not really disappeared. Little did we know back in 1993 when we wrote this article what kind of monster the schwa would turn out to be. Actually, I wasn't aware that any problem existed with the Azeri alphabet until I walked into one of Baku's highest educational institutions this past June. One of the top administrators confided, "We really have a problem with our new alphabet - it's that upside-down 'e' (the schwa). Do us a favor: in your next issue of Azerbaijan International, replace it with a combination "ae" or some such letter, and put a footnote at the bottom of the page explaining what you've done. The Latin alphabet is capable of handling every sound in our language. We shouldn't have created a letter that was outside the standard Latin alphabet." I listened. This wasn't just some academic who happened to be disgruntled about a pedantic, esoteric matter. A respected linguist, he had been a member of the government's advisory board that had helped make the decision to adopt the new Latin alphabet when Azerbaijan gained its independence in 1991 and to rid themselves of Cyrillic which had been imposed on them by Stalin's regime. Photos: (below left) Azerbaijan's first alphabet primer in the new Azeri Latin script was introduced in the 1992 school year and prepared by Yahya Karimov. Its bright and colorful illustrations are delightful, playful and culturally relevant to Azerbaijan, unlike the primers of the Soviet era. (below right) One of the many attractive and culturally relevant pages of Y.S. 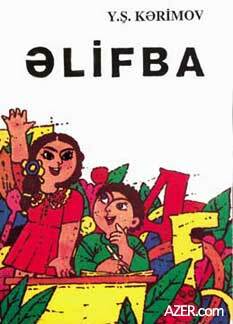 Karimov's "Alifba", the first alphabet primer published for first graders in the Azeri Latin script, 1992. Note the nationalistic trends evident in the illustrations, such as the mugham trio pictured here with khananda singer with gaval, and the tar and kamancha players. "We were mostly linguists on that committee who made the decision to adopt the new Latin alphabet," he said. "We knew all about language, but we didn't have the technological computer expertise to anticipate all the complications we were getting into when we created a few letters of our own." That troublesome upside-down "e" represents the /æ/ sound in the Azeri language. (In English, it's like the vowel sound in the words "fat cat.") The difficulty is that Azeri is the only language in the world that uses this letter. Curiously enough, this symbol was not included in the original alphabet that was adopted on December 25, 1991. At that time, the schwa sound was represented by an "a" with two dots (umlaut-ä). But since this sound is the most frequent in the entire language, the dotted "a" became very cumbersome. Not only was it awkward to write all those dots; it was slow and tedious and didn't appeal aesthetically, no matter whether the letter was written by hand or typed. 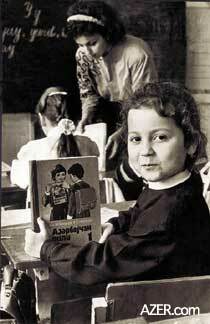 Left: First grader at a Russian-language school shows off her Azeri-language primer written in the Cyrillic script. In the early 1990s when this photo was taken, Azeri Cyrillic was still much more widely used than the modified Latin script which was officially adopted in December 1991 (Photo: Litvin). For example, the first name of Azerbaijan's first elected President is Äbülfäz, which, when written with the new alphabet, needs six dots. Arabic, a script notorious for its dots, uses only three; Cyrillic, none. And so it was that on May 16, 1992, the first official change was introduced into the six-month-old Azeri Latin alphabet; the upside-down "e" was resurrected, like the eternal phoenix rising from consuming flames. There was a history to its reappearance. Actually, it was one of the oldest letters in the non-Arabic representation of the Azeri language. Created in 1928, when the Latin script was originally adopted, this letter somehow managed to escape unscathed during the Cyrillization (1939-1991) of the Soviet era. For that reason, it's shape, though strange to Westerners, was very familiar to Azerbaijani readers. (But back to my story.) Time passed. I returned to California and had a chance to speak with some of the professors teaching Azeri classes in universities in the United States. "What are you doing about the upside-down 'e' in the new script?" I asked. One paused, "Well, I don't have it on my computer yet, so I'm writing out all the instructional material by hand." Another was managing quite fine, except for "the e" (as we soon came to call it). "I could work ten times faster if I could find a typeface with 'the e,'" he told me. At first he had tried using the symbol known as "partial differential" () on the standard keyboard. But it really didn't align well. Like a tall, awkward, gangly kid who is always standing head and shoulders above his peers, somehow this shape just didn't fit. Then he managed to find a Cyrillic Azeri typeface, and so every time he needed "the e", he had to copy and paste it in-sometimes two or three times in a single word. The last time I talked with him, he had finally managed to get a customized typeface - and life was just fine. I called a U.S. company that has a joint-venture project in Azerbaijan. "The upside-down 'e'? Well, we don't quite know what to do," they told me. "I'm sure someone can design it for us if we need it - but we're still in a dilemma about which language to use - Russian or Azeri. We're trying so hard to be appropriate and sensitive. It's really important to us not to offend anybody." Shortly afterward, I contacted a good friend of mine who is a computer programmer. I wanted to explore the implications of designing a new letter for the computer. "It's no problem," he said. "No big deal. You can design any shape you want. There are plenty of software packages available to design your own font." He failed to mention that the cost for these "design-it-yourself" software packages begins at about $250, and in my own case, where would I find the hours to sit and plod through some manual to figure how to make an upside-down "e"? I asked my friend to do a little research to find out what other implications there might be for the computer, such as international copyright regulations and e-mail transmission. Copyright turned out to be, as he put it, "a can of worms." Legally, you can't just add a letter or two to an existing font that somebody else has created and then sell it as your own. As for e-mail, transmission is possible, though a bit involved, as "binary file transfer" (which preserves the text exactly as written) must be used (software packages like UUENCODE and UUDECODE). Of course, both transmitter and receiver need identical Azeri fonts. But my friend soon tired of the subject, and it wasn't long before he was sending me an e-mail, saying, "Come on, Blair, quit 'e-bashing' (obviously new slang for what he perceived me to be doing to the Azeri alphabet). Lay off. I told you everything is possible with computer technology. Don't go making such a big deal over this 'e.'" "Hey look, I'm not 'e-bashing,'" I tried to defend myself. "Sure, computers can do everything if you have the social and economic infrastructure to support it. But at what price? No one can afford to buy fonts for $100 in Azerbaijan. Doctors only make $20-$30 a month (U.S. currency equivalent). It would take half a year just to earn that amount of money. And with rampant inflation and the war - it's totally out of the question. "And," I continued, "if the 'e' weren't such a big problem, how is it possible that you can walk into any bookstore in Baku and count on one hand (no exaggeration) the books that have been published in the new Latin alphabet? Nearly two years have passed since the alphabet was officially adopted, and Azerbaijanis are a highly literate society. But where are the books in the new Latin alphabet? There's a real problem here. "If you take a very close look at the Ministry of Education's first primer (Karimov, 1992), it seems they had to customize every single upside-down 'e' by first printing an 'o,' then drawing a line through the center and cutting out a little wedge-an incredibly painstaking process." Somehow, my friend still wasn't convinced of the complications involved, and it wasn't long afterwards that his friends started calling me. "Why are you making such a big deal about the upside-down 'e'?" they wanted to know. "Look, Azerbaijan simply can't support it. Economically, they're a new nation struggling to enter the market economy, and they should tap into the huge investment (time, money and intellectual talent) that is awaiting them by using the standard Latin computer keyboard. They're a small country-only 7-8 million people. Who's going to manufacture a typewriter for such a small market? And thousands of typefaces already exist for the computer. Why should they redo the work that's already been done for them?" Days passed. More complications with the Azeri script became evident as we continued to try to put the magazine together. Our typeface, which obviously had been designed for 12-point size print, couldn't produce the "hatted g" when sized larger or smaller. And we had not gotten around to producing a bold or italic set. E-mail transmission was out of the question, since none of us had the required software. In fact, we couldn't even swap disks with anyone else who had Azeri Latin fonts. Since everybody had tried to solve the problem on his own, the upside-down "e" on each customized typeface had been assigned to a different key. On one, you pressed "option + zero"; on another, "alternate + comma", and a third required three strokes "alternate + shift + z." The ergonomics were dizzying. Ideally, the most frequently used sounds in an alphabet should be represented by keys that are on, or, at least close to, what is known as the "home keys" (a-s-d-f or j-k-l-;) so that the typist can type quickly. But our font had positioned the upside-down "e" with option plus the zero key. To type it was like making the little fingers of each hand pirouette like ballerinas across a stage in opposite directions. Moving off the home keys so frequently to the extreme edges of the keyboard makes it difficult to return to the home keys successfully and could result in a whole string of misspelled words. Let's not talk about what happens to one's speed with these customized letters - when two, three, and sometimes four strokes are required to produce one character. Then there was the problem of font style. Among the customized Azeri fonts that exist in the United States right now, most of them resemble Times - a font with serifs. Azerbaijan International magazine uses Helvetica which is not based on serifs. So our English font doesn't match the Azeri. When we needed a single letter from the Azeri alphabet (as an example for this article in English), we had to open up the Azeri font and "paste" it in every single time. Despite all that effort, it had to be re-aligned each time, as it was slightly lower than the other letters. It was also thinner. And it didn't match font styles. But the telephone calls from "friends" weren't over. "It looks like you're really saying that the Azerbaijanis should simply adopt the English alphabet", one of them kept pounding away at me. "Not at all," I replied. "I wouldn't wish the English alphabet on anybody - especially with its incredible lack of sound-symbol correlation. We have too few symbols to represent so many sounds, especially the vowels. No, let Azerbaijanis designate all their vowels. Just let them find a creative way to do it on the standard keyboard. There are all kinds of diacritical marks that can be added (¨ ´ ` ) not to mention the "æ" that already exists as one letter. "It's obvious that the Azeri alphabet designers were really thinking with pen and pencil when they added these new characters. There's no problem to add a little tail or slash to an 's' or a 'c', or to omit a dot from an 'i' when it's done by hand - it's only a slight variation. But when it comes to computers, either the letter exists or it doesn't. "That's why the new Azeri Latin alphabet, seemingly so close to the one used in the Western world today, is, in reality, so far away." "But, then, you're making the alphabet dictated by technology," my friend countered, unwilling to give up. "Azerbaijanis should be able to choose any symbol they want. Technology should serve them." "You're right. Man should not be a slave to technology. The 'tail shouldn't wag the dog'. But that's idealistic and unreal. Technology always has its own limitations and parameters. It's not the first time technology has shaped the alphabet. The same story has been repeating itself since the origin of the alphabet. Greek and Latin were clearly determined by the hammer and chisel against marble - it's easier to carve straight lines in stone than rounded ones. That's why so many of our capitals are based on straight lines. The cursive Arabic was influenced by pen; cuneiform, by clay and sharp stick. Other alphabets were created by carving on bamboo. Simply today, the determining tools are fonts, computer keyboards, and satellite transmissions - the only difference being that they're a bit new and unfamiliar in the alphabet designers' hands." In the end, alphabets are really all about communication, not isolation. They're simply codes to represent speech and provide a means to express ideas beyond time and space. Azerbaijanis don't need to 're-invent the wheel'. A whole vast world is out there ready to propel them into the 21st century if they can only find creative ways to fit their own unique language and circumstances into it. Paul Jordan-Smith of UCLA's Office of Academic Computing contributed to this article.